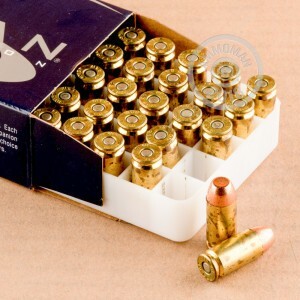 Firing Speer Lawman range ammo is just like firing Speer Gold Dot self-defense ammo without the expensive hollow point. These .40 S&W rounds, packaged in a 1,000 round case (20 boxes of 50) mimic the ballistic performance of 180 grain Gold Dots, making them perfect for target practice with your Smith & Wesson M&P, Springfield XD, Glock 23, or Browning Hi Power. 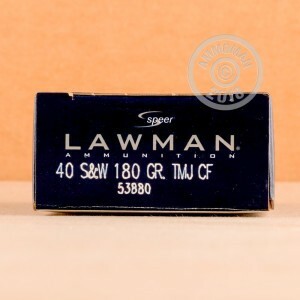 Lawman ammo uses a total metal jacket (TMJ) bullet, which costs less to produce than FMJ ammo. The primary downside of TMJ plating is incompatibility with firearms that have ported barrels, as the ports can shear the bullet. However, TMJ bullets also have an advantage in that they cover the entire lead core, which is typically left exposed by the FMJ manufacturing process. This makes them a bit safer to use from a lead exposure standpoint. Fill your cart with $99 or more of ammo and get FREE shipping direct to your doorstep. That's the simple rule AmmoMan follows as a way of thanking high volume buyers.